Ultimate Movie Star, The. Turner Classic Movies Joan documentary, directed by Peter Fitzgerald and narrated by Anjelica Huston. It originally aired in August 2002, when Joan was their featured "Star of the Month." The doc is included on the Mildred Pierce DVD. Understanding Heart, The. MGM silent, 1927. Directed by Jack Conway, 67 minutes. Joan stars as "Monica Dale," a lookout for the Forest Rangers. 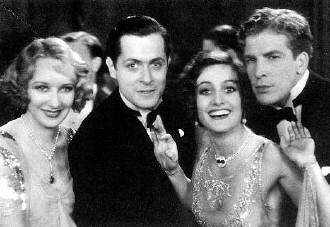 Joan says in CWJC: I got my first rave reviews in "The Understanding Heart" because [co-star] Francis X. Bushman, Jr., let me steal almost every scene. A fine gentleman. Universal Studios. Joan made two pictures for Universal, 1955's Female on the Beach and '65's I Saw What You Did. She also dated studio head Milton Rackmil for a time in the mid-50s. (Their engagement broken off because they argued over who would be dropped off first...) She also appeared on the Universal TV series The Sixth Sense in 1972. Unkefer, Linn. Publicist for Whatever Happened to Baby Jane? Unknown, The. MGM silent, 1927, starring Lon Chaney. Directed by Tod Browning (of Freaks fame), 65 minutes. Joan plays carney-girl "Nanon," who hates men's hands (which eventually leads her obsessed co-worker Chaney to cut off his arms for her!). Says Joan in CWJC: "The Unknown" was a good film--and working with Lon Chaney was both traumatic and delightful. He demanded so much from me I was scared, but I seemed to do it right. The film had been considered missing for years but was rediscovered in 1968 at the Cinematheque Francais, languishing among cans of films legitimately marked (because of missing titles, etc.) "L'inconnu"---"Unknown"! Of the film itself, Joan says in CWJC: ... silly but fun--Bob Montgomery was terrific, I was awful, mostly because I was miscast. Untouchables, The. Joan appeared on this U.S. TV series in a 4/13/61 episode. USO (United Services Organization). Joan first became a supporter of the USO during WWII, an association that continued into the 1970s. On 3/2/65, the New York City branch named her Woman of the Year. The organization was one of the beneficiaries of her will, receiving one share of her estate. How can I submit my idea for a new Stamp? Almost all subjects chosen to appear on U.S. stamps and Postal stationery are suggested by the public. Each year, Americans submit proposals to the Postal Service on literally thousands of different topics. Every stamp suggestion is considered, regardless of who makes it or how it is presented. On behalf of the Postmaster General, the Citizens' Stamp Advisory Committee (CSAC) is tasked with evaluating the merits of all stamp proposals. Established in 1957, the Committee provides the Postal Service with a "breadth of judgment and depth of experience in various areas that influence subject matter, character, and beauty of postage stamps." Subjects should be submitted at least three years in advance of the proposed date of issue. This allows for sufficient consideration and for design production, should the subject be approved.